Aftass Club Sidi Kaouki offers you the opportunity to immensely enjoy a surf holiday on your own, with friends or family. It is an ideal combination of Moroccan hospitality, excellent food, a secluded and tranquil vibe of Sidi Kaouki. The accommodation provides you with all the facilities and hearty support to make you feel at home. If you are looking for instructions to catch your first wave or to take your skills to a new level, some side activities, and expeditions to enhance the experience or just some space to relax, you are already at the right place! Dar Iziki surf house is typically decorated in Moroccan style, with exceptional views to the sea and the Sidi Kaouki beach is less than 2 minutes of walking. This tranquil house is shared with other surfers, living together in a very relaxed and friendly atmosphere. The surf house is equipped with 5 double rooms and 2 triple rooms with private bedrooms. The house has 2 extra bathrooms, sharing kitchen and salon and WIFI, and a terrace where you can relax and watch the sunset, read books and magazines. The open terrace is perfect for barbecue at night or just to chill out. The town itself is a great place to discover with extraordinary restaurants, surf shops and traditional markets, all just a few minutes of walking from the house. Aftass Club Sidi Kaouki provides cultural surfing holidays, and their mission is for you to acquire a love for surfing and gain an insight into and understanding of the rich culture of Morocco. The Aftass Club Sidi Kaouki team are at your service to achieve this. 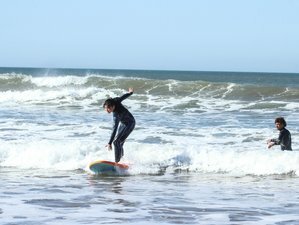 You will learn the basics of standing up and catching a wave and surf at different surf spots along the coast. Your day will start at 10:00 a.m. and finish around 5:00 p.m., although as they want you to get the most out of your time with them and in Morocco generally. If you would like an afternoon off to just lie on the beach, wander in Essaouira’s souk, or have a hammam, a traditional Moroccan steam room, they are more than happy to facilitate this. You will start surfing and get addicted and achieve skills after lesson one. Skills need to be achieved after lesson two. You will catch waves and achieve those skills after lesson three. During the camp, you will experience many wonderful surf spots: Diabat Beach and Essaouira Bay, known as surf and kite spot and beach breaks, Iftan Beach and Tafdna Beach, known as surf spot and beach breaks, and Tagenza Beach, a surf and kite spot and riff break. This surf camp will take place in Sidi Kaouki Beach, Morocco. You will be served daily breakfast ,include fresh juice, coffee or tea, pancakes or eggs, bread, and some special surprise. You can enjoy total peace and quiet during your stay, go surfing or kitesurfing every day, walk around never ending beaches, ride a horse, quad, or camel, visit the beautiful harbor town, Essaouira, or watch the wonderful scenery from the terrace while you practice some yoga. You can also take advantage of other sports or relaxing massages that are available for an extra cost. Please book your flight to arrive at Essaouira-Mogador Airport (ESU). Transfers from these airports are included. Aftass Club Sidi Kaouki will pick you up from the airport should you book the full week stay. You can take the Eurolines bus, which has connections from any city in Europe to Agadir. If you are already in South of Spain, the cheapest option is to take the boat from Tarifa to Tanger for 25 EUR and in Tanger, catch the CTM bus to Essaouira for 35 EUR. Buses from Tanger to Essaouira leave around noon. Aftass club will pick you up from the location in Agadir or Marrakech for some extra fee. You can also take a taxi directly from Marrakesh or Agadir to Sidi Kaouki for 60 EUR. You can also take a taxi directly from Essaouira to Sidi Kaouki for 15 EUR. Airport: Essaouira-Mogador Airport Airport transfer included: Essaouira-Mogador Airport No additional charges. You can request this in the next step. Aftass Club Sidi Kaouki offers surfing and kitesurfing lessons, accommodation, and surf equipment rental in Morocco.